Atmel-ICE is a powerful development tool for debugging and programming ARM® Cortex®-M based SAM and AVR microcontrollers with on-chip debug capability. Official reference can be found here. 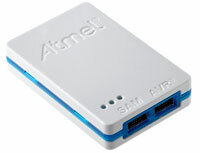 When installing the Atmel-ICE on a computer running Microsoft Windows, the USB driver is loaded when the Atmel-ICE is first plugged in. Atmel SAM Atmel | SMART offers Flash- based ARM products based on the ARM Cortex-M0+, Cortex-M3 and Cortex-M4 architectures, ranging from 8KB to 2MB of Flash including a rich peripheral and feature mix.